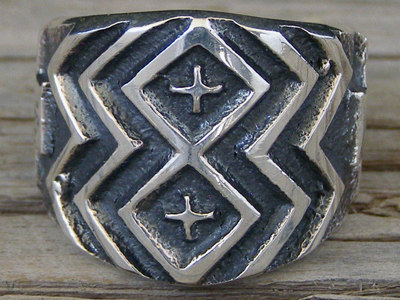 This sandcast ring by Kevin Yazzie is done in a cigar band style and is a relatively heavy cast, meaning that it skimps not at all on weight and thickness of the band, giving it a solid, heavy feel. Kevin carved two four corners crosses into the middle of his tufa mold, one above the other and enclosed them within diamonds. He buffed this ring so that the high parts of the casting are shiny silver, while the nooks and crannies are deeply oxidized. Indestructible. Hallmarked K inside and stamped Sterling. Width at back of shank: 1/4"